Mother Nature has outdone herself to finish up the month of April and begin May. Summer-like temps will be the main story line for this week with dry conditions expected through Thursday. Currently, a surface high pressure system sits in Kentucky driving our clear weather and keeping all rain chances away. Highs today look to reach near average with temps expected to reach the 77° mark. With clear skies all day today continuing into the overnight hours, lows will fall to 57° tonight. Luckily, another rapid warm-up is expected for tomorrow. Mostly sunny skies will allow temps to reach into the 80s with a high of 82° for tomorrow. For those who have been patiently waiting for above average temps to return, they will finally be here Wednesday and Thursday. Ample amounts of low-level warm air advection will help to bring our temps to the above average point. Both days will be characterized by highs in the mid 80s and partly sunny skies. Dew point temps look to be in the low 60s both days, so you may get some of that sticky feeling if you are outside for long periods of time. Additionally, we may need to keep an eye on the winds both days as winds may come close to the 15 mph mark with gusts upwards of 25 mph. Overnight lows both nights will stay pretty warm with temps in the upper 60s. 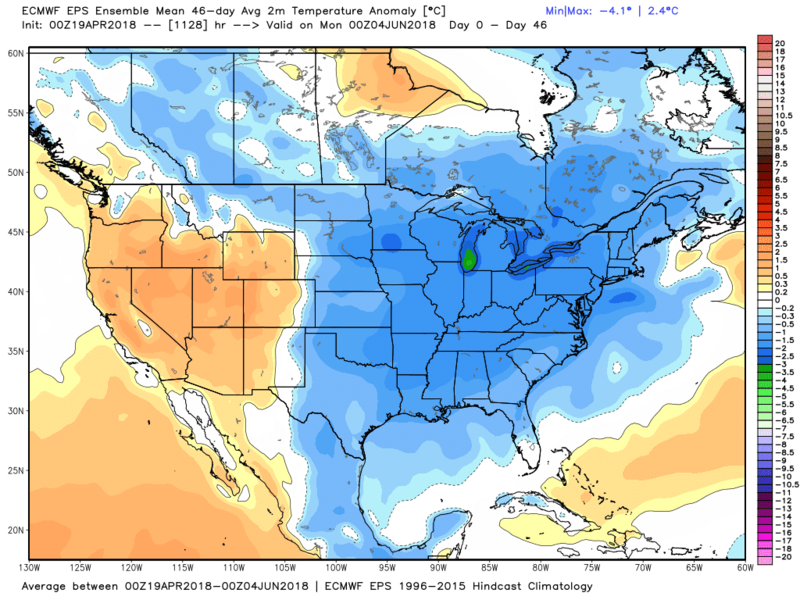 It's the first official weekend of May and it will be a very summer-like preview. Many events are ongoing this weekend including Memphis in May's Beale Street Music Festival. Whether you're planning to head down to Tom Lee Park or enjoying the weekend another way, temps will be around to just above average throughout the weekend. So what exactly is in-store for our Friday through Sunday period? Friday and early Saturday both have the possibility of some rain while Sunday appears to be rain-free. On Friday, temps look to reach into the low 80s. 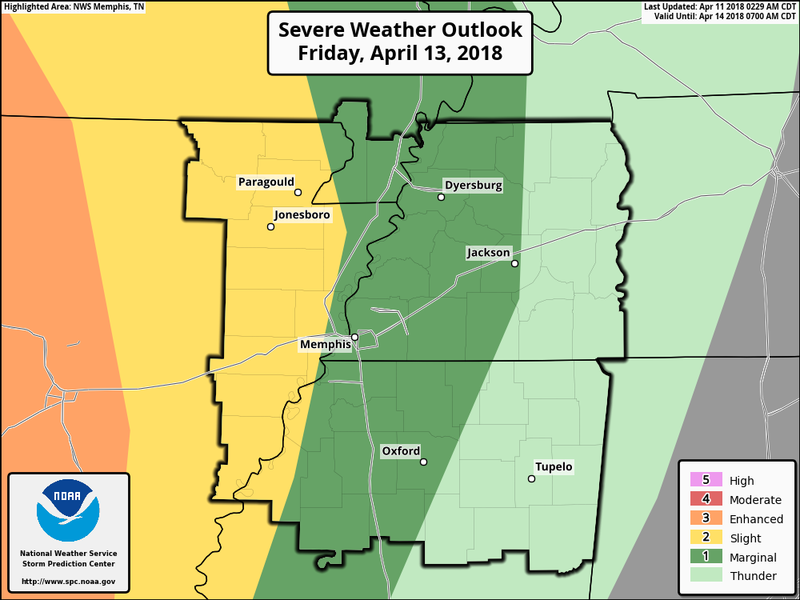 The semi-bad news for Friday is that there is the possibility of some scattered showers and thunderstorms associated with a weakening cold front moving through the area. 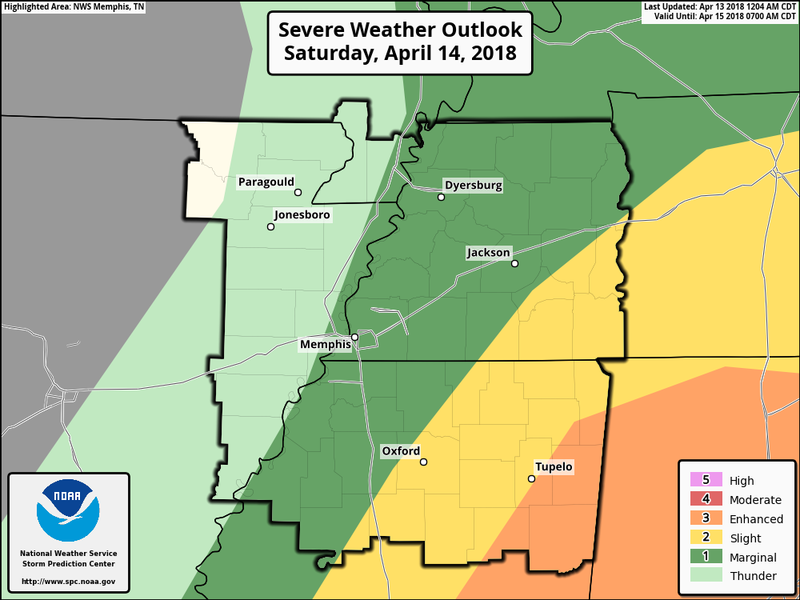 The cold front may provide enough lift for some thunderstorm development; however, severe weather does not appear to be a concern at this point. Temps will remain fairly mild Friday night with overnight lows only dipping into the mid 60s. Some of Friday's showers may continue into the morning hours on Saturday. Once the showers dissipate, Saturday afternoon lingering cloud coverage will leave us with mostly cloudy skies through the remainder of the day. Luckily, highs will stay in the upper 70s, so plenty of warmth for those with outdoor plans. Sunday appears to be the best day for this upcoming weekend. A surface high pressure looks to dominate much of the eastern U.S., keeping any rain chances out of our area. Along with our mostly sunny skies for the day, it will actually be pretty comfortable temperature wise as well. Highs in the upper 70s with dew point temperatures in the mid 50s will result in some nice, non-sticky weather for Sunday. Editor's Note: This blog post is authored by MWN Meteorologist Intern Reggie Roakes, who is graduating with his Bachelor's Degree in Meteorology next week and will continue into a Master's program in the fall! 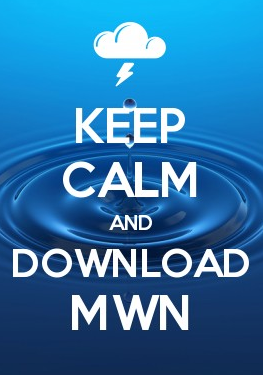 Reggie has been a valued member of #TeamMWN since the start of the year and we welcome him into this expanded role ! What's in store for the next seven days? Much better weather (at least into the start of next work week, so pay attention)! 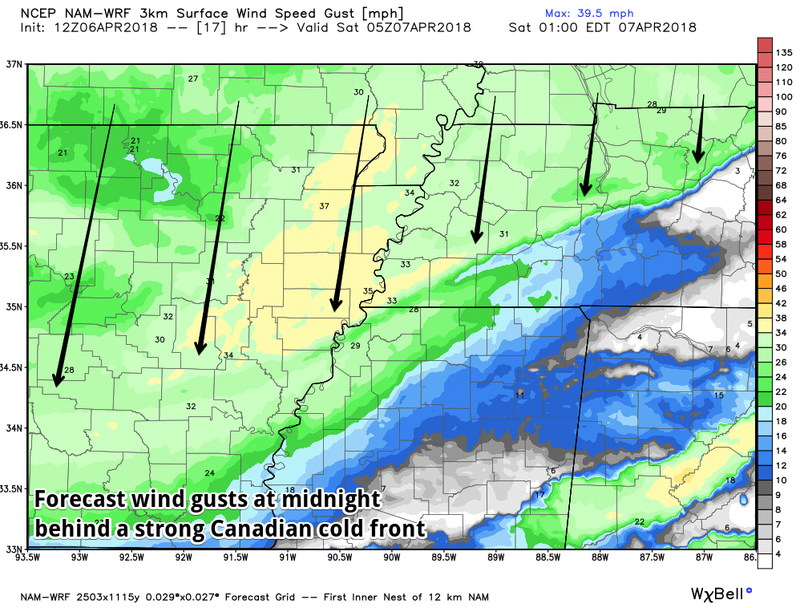 A high pressure system centered over Texas has provided dry, pleasant conditions for Memphis Friday. That light wind this afternoon, combined with ample sunshine, has allowed for a fantastic afternoon. As we move into Friday evening/night, clear skies will take a temporary break: a weak low over the Great Lakes region will develop a weak front that will dive south. You can let go of that breath you're holding. We will mainly see passing clouds since the air here is a little to dry and won't be sufficient for any real rain threats, just an isolated stray shower is possible early tonight. Look for a low around 52. This is the part we have all been waiting for: the first completely dry weekend of 2018!! So far this year, at some point on every weekend we have gotten rain; however, this weekend that will not be the case. Quickly following the effects from Friday night's weak low will be a ridge setting up over the central U.S. This will advect in dry air from the north/northwest on Saturday and Sunday. That means cool air will be pulled in from the north and our skies will remain clear. Lots of sun will warm that northerly wind, so grab the shades and the T-shirt! 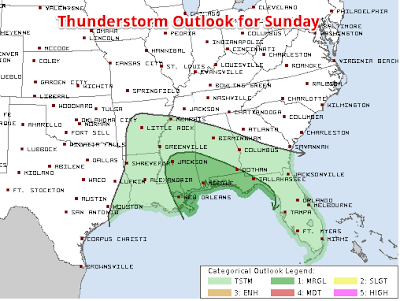 Looks for highs Saturday to be in the low 70's and Sunday in the upper 60's. 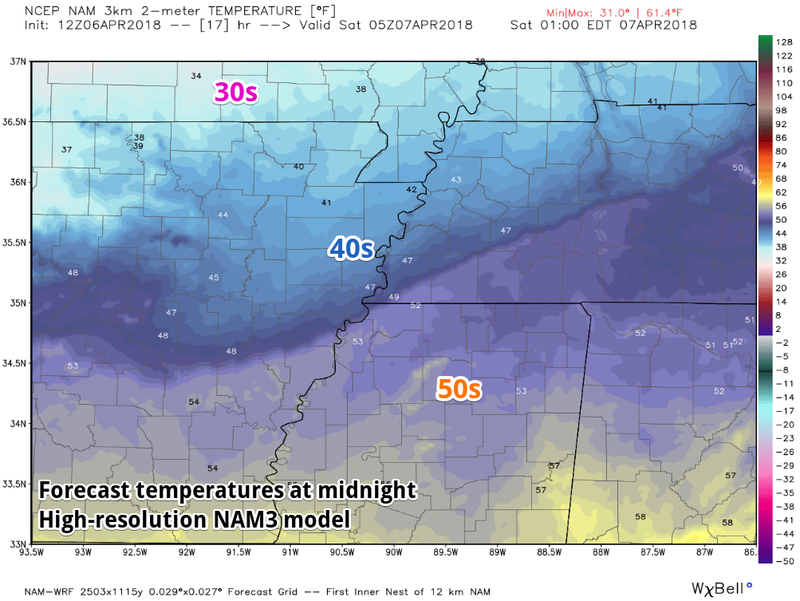 Likewise, the lows for both Saturday and Sunday night will be in the mid to upper 40's. I know what you're thinking, "We got a nice weekend, so now we are going to get rain." Well guess what, that's not the case...at least not yet. A building trough to the west at this stage of the forecast will start to nudge our friendly ridge eastward. This will start to shift our winds to a southerly flow by Tuesday. For Monday though, we will see winds more out of the east. That means that we will only be slightly warmer than the weekend with highs topping off in the mid 70's. Monday night, winds should finally start pulling warmer air from the south, so we will see a low in the mid 50's. This is the part of the forecast everyone is waiting for - the 80's! Ample southerly flow with warm air advection (the movement of warm air into an area) from the inbound trough will crank the heat up Tuesday afternoon. We will see temps reach the low 80's, but this will be prior to the full force of the trough when warm air advection is greatest. Tuesday night, a few clouds start to form as moisture content over the area increases as we start to see more southerly flow. Increased clouds and the southern wind will limit our mercury drop Tuesday night and we only get lows in the low to mid 60's. Rising motion formed from diverging winds aloft may start to feed the opportunity for a few showers to develop. The forecast at this point gets a little tricky. The low in the northern Great Lakes associated with this trough will weaken, leading to front stalling northwest of the Memphis area. 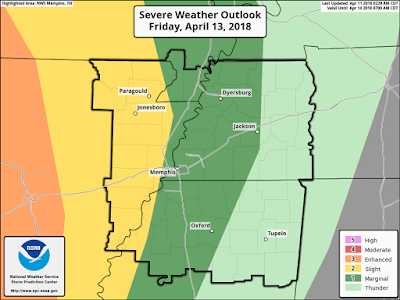 The rain chances Wednesday and the remainder of the forecast will depend on where exactly this front stalls, so we will be updating our forecast as we get closer to the event. Despite increased cloud cover Wednesday, highs will top off near the low 80's. Wednesday night clouds will help insulate temperatures and keep our low around the mid 60's. Thursday is essentially a repeat from Wednesday. The amount of rain this day will depend on where exactly the front sets up, but for now chances look fairly low as it remains to our northwest. 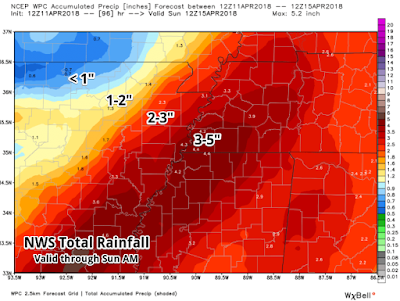 Northern Mississippi will remain drier, while those just north of Memphis could receive a few more showers or storms, so we will be watching this part of the forecast closely to nail down the exact details for it. Highs should still manage to get into the low 80's. Continued cloud cover Thursday night prevents a steep temperature drop with lows in the mid 60's. 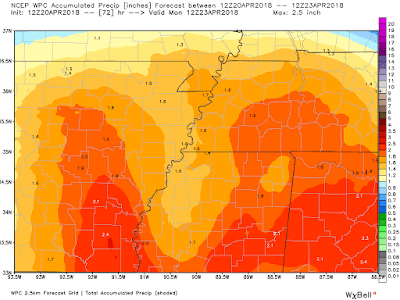 And the trend continues... High pressure north of the boundary will start to nudge the stalled front southward, increasing our rain chances further for Friday, making this the mostly likely day of the 7-day forecast for scattered showers and afternoon thunderstorms. The 80's will be gone by this point in the forecast since scattered rain, combined with cloud cover, will help cool things off slightly. 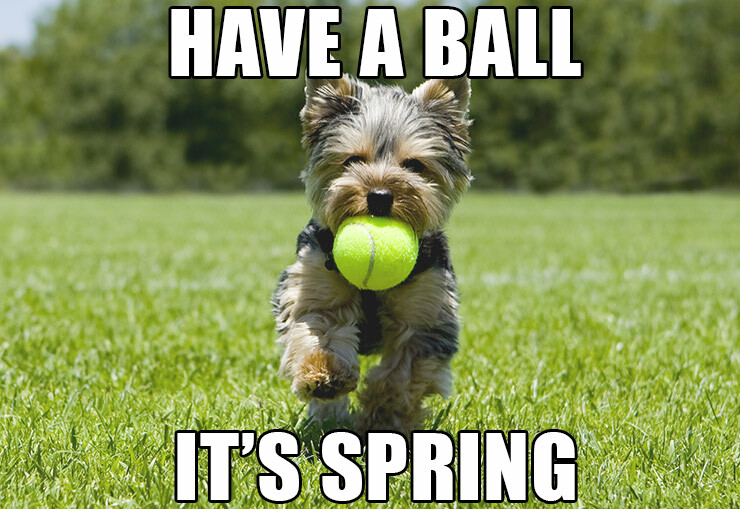 Expect highs to be in the mid 70's. 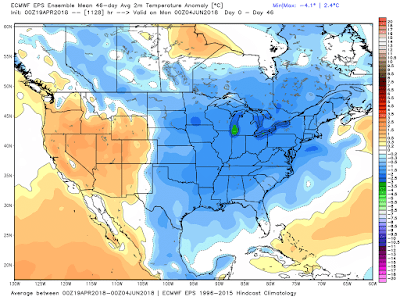 Thoughts on May for now seems to be a slightly warmer trend, which will not be argued with. 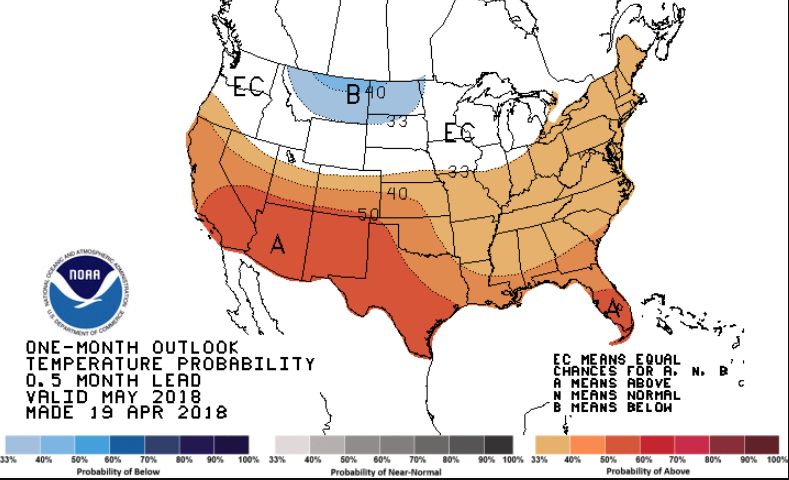 The first part of the forecast looks to be the possible trend for the month with ample opportunities for rain to continue. 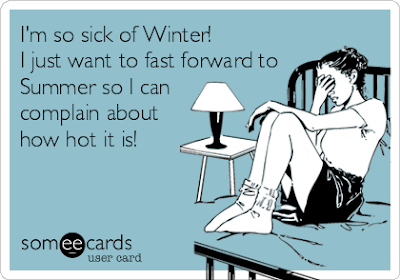 Maybe we can tolerate that though, if we can get the warmer weather to finally stick around. 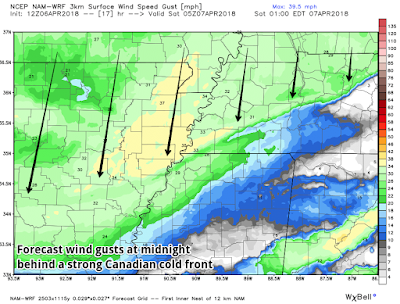 Editor's Note: This is the first of what will likely be many blog posts authored by new MWN Meteorologist Intern Caroline MacDonald. We look forward to posting these more in-depth weather updates on a regular basis than we have of late. Caroline is just one part of that diabolical plan to keep you better informed on area weather! 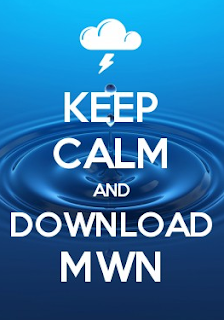 Please welcome her to MWN! I wish I could say that the rest of this week was going too be sunny and warm, but unfortunately Mother Nature won't allow me to. This week looks to be characterized by below-normal temps with plenty of clouds and some showers. Scattered showers from earlier today will continue to move out through the overnight hours tonight. Temps will fall into the mid 50s overnight. Dew point temps in the low 50s and saturated grounds from today will leave prime conditions for overnight/early morning fog development. Fog development will depend on how the skies clear overnight. If our cloudy skies remain in place, expect patchy fog in some low-lying areas. If we are able to get more clearing, more widespread fog development will be possible. Any fog that develops should dissipate around sunrise. The upper-level low that brought showers today will continue to hang around our area tomorrow, leaving cloudy skies behind. There is a slight chance of showers into the afternoon hours. Any shower that develops will be light and scattered in nature. These dreary conditions will keep temps in the 50s through the AM hours and the 60s into the afternoon. Expect high temps to be well below-average with highs near the mid 60s. We will finally begin to see some clearing in the cloud coverage as we head into the evening hours tomorrow with temps falling into the mid 50s overnight. Things look to start off pretty nice on Wednesday with some partly sunny skies. By the afternoon, another cold front will be knocking on our doorstep. Luckily we won't have to worry about temps dropping drastically with this front. High temps will remain in the upper 60s with overnight temps falling into the mid 50s. Along with this front will be some more scattered showers. Showers look to begin around / after the lunch hour and continue through the evening hours. While we will not see a lot of rainfall in terms of total accumulation, we will see enough that you may want to keep the umbrella handy for those sprinkles. Some early morning showers may linger from the night before, but skies will begin to clear as we move through the day. We may even get to see the sun, just maybe. This clearing will help to propel highs once again into the upper 60s. Overall, Thursday looks to be the go-to day for the week for those outdoor evening plans if you have any. Partly cloudy skies will allow temps to fall into the low 50s overnight. Friday appears to be one of those good news and bad news types of days. The good news is we may get some more clearing, which will allow some partly sunny skies during the AM. The bad news is that by the afternoon, yet another cold front poses to move through. This will bring another bit of showers along with it. Regardless of the showers, temps will remain below-normal with highs topping off in the upper 60s. While there are several rounds of showers possible this week, there won't be heavy rainfall events nor any thunderstorms. Less than half an inch is expected now through early Saturday. Despite being past Tax Day, with most foliage blooming or budding or growing, late winter still seems to want to keep popping its head up like an annoying rodent from Whack-a-Mole. The past couple of weeks have been evidence, given that we had an 80-degree day a week ago, only to be followed up 3 days later by a record cool day in the mid 40s and several recent mornings with wind chill factors and patchy frost. A persistent pattern featuring an upper level trough over the eastern U.S. is to blame. 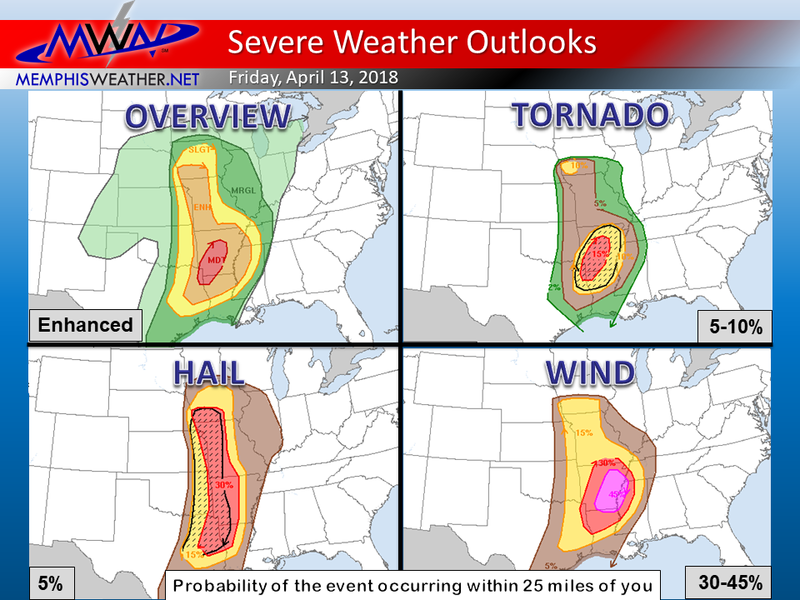 It also is responsible for a relatively slow start to severe weather season this spring. What does the near-future hold? For now, we're back in "warm-up" mode after some frosty areas early this morning. April sun and wind that has shifted to the east, rather than north, means temperatures climbing towards 70 today. Saturday will see an increase in clouds, but wind that shifts further around towards the south. Pair it with a morning low that is about 10 degrees warmer, and we should make it to 70 without much trouble. That is still several degrees below our mid-April average though. There is a low chance of some afternoon sprinkles, but overall your Saturday looks to be pretty pleasant for outdoor activities and spring festivals! 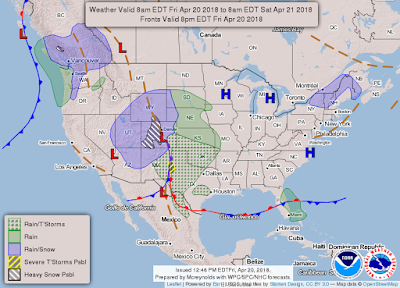 This is when spring rains make their return as weak low pressure moves slowly out of the southern plains and scoots by to our south. Since it will be to our south, with little in the way of instability feeding into the area, I expect we'll see rain and very little thunder. That rain arrives Saturday night (chances increase during the evening) with the wettest period late overnight into Sunday morning. However, scattered showers stick around most of Sunday as the low moves slowly by. It may not be a washout, but you can just pretend that it is as timing any short dry spells will be difficult. 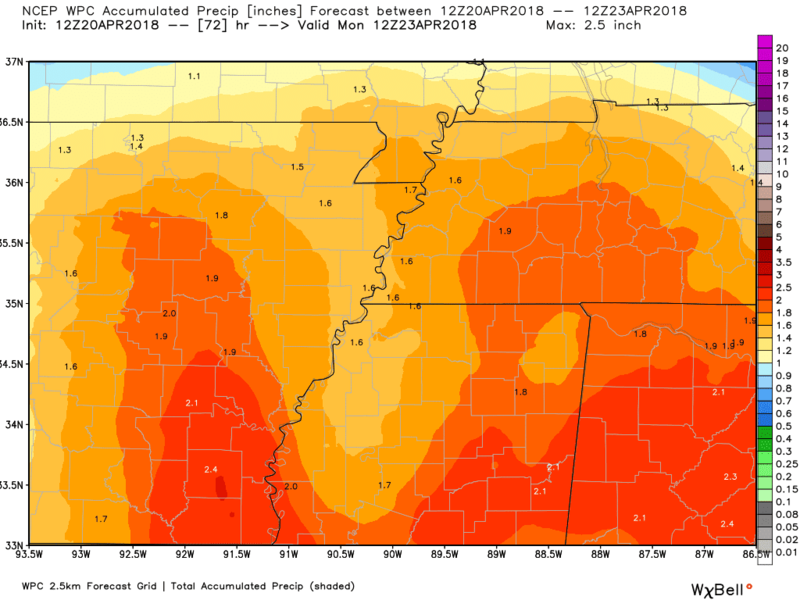 Total rainfall will likely end up in the 1-2" range by Sunday night. Temperatures will be below average, as expected on a rainy day, but not too cold - lows in the mid 50s and highs in the lower to mid 60s. 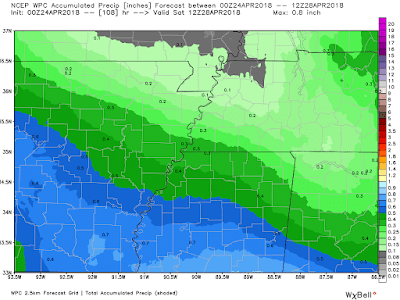 Forecast precipitation amounts through Monday morning from the NWS Weather Prediction Center. 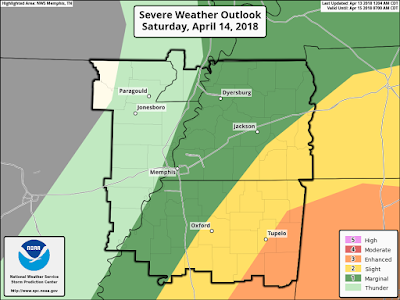 The Severe Weather Outlook for Sunday from the Storm Prediction Center shows that Memphis will be on the edge of a "general" risk of thunderstorms. 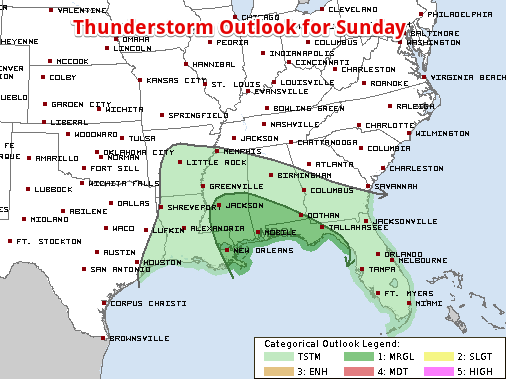 No severe weather is expected, and in fact, there is a low chance of any thunder at all. 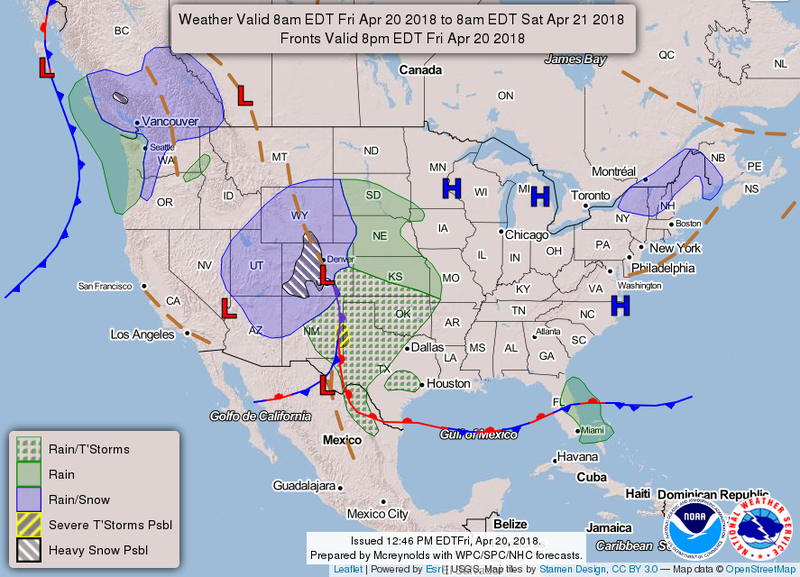 As the low slowly shifts east across the southeast U.S. Monday, we'll see "wrap-around" showers off and on Monday, but it will be drier than Sunday. Temperatures will be very similar to Sunday though, so look for 60s in the afternoon. We should catch a bit of a break Tuesday. 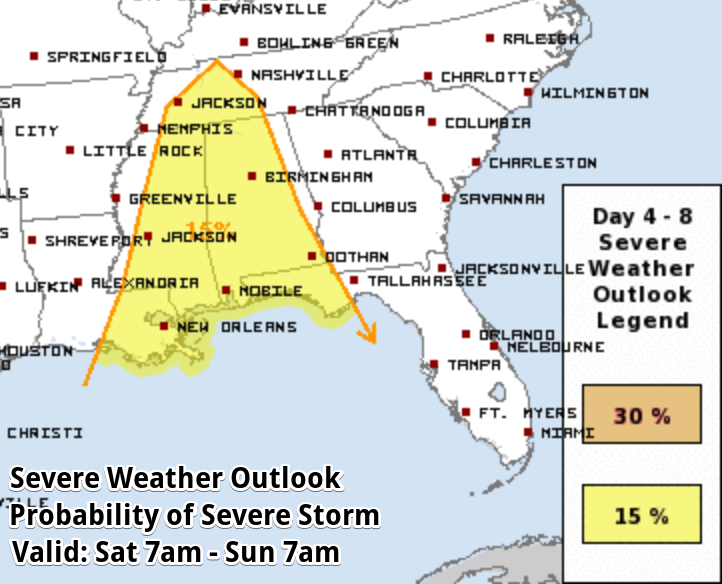 I don't expect a ton of sun, but rain chances should only be about 20% as the low weakens and departs the region. There is no strong high pressure center replacing it though, thus the lingering clouds mixing with a bit of sun. Temperatures will be a few degrees warmer, maybe pushing 70 again. The mid-week will see another front push through on Wednesday, bringing yet another chance of scattered showers and highs near 70. The longer-range shows a dry day Thursday and another front on Friday, but temperatures that reach 70 degrees both days. Fortunately, there are no cold air masses behind any of these, so there is no frost or really cold mornings in the crystal ball. If all goes to plan, we should see things clear up in time for the last weekend in April. 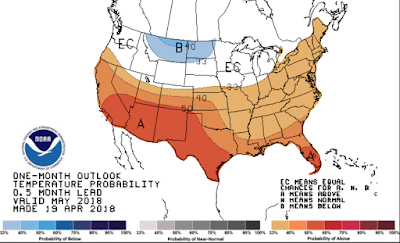 Long-range climate models are split on May, but I am thinking that temperatures will be a bit below normal to start the month, then closer to normal by mid to late May. By late May, "near normal" means mid 80s, so don't be surprised if we warm up fairly quickly once we get into May! 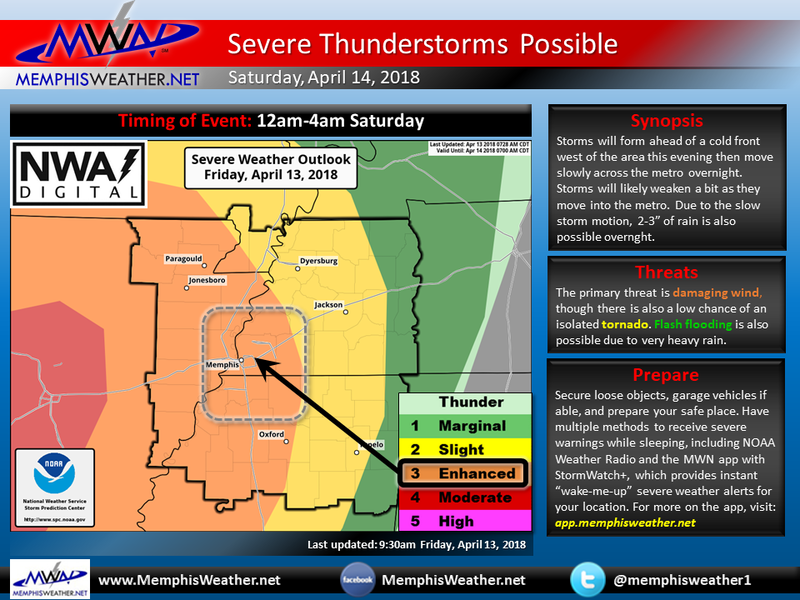 As always, you can get the latest forecasts for the next 7 days, as well as current conditions, StormView Radar, and StormWatch+ severe weather alerts all via the MemphisWeather.net app. Find it at the links below and follow us on social for routine updates.